Crunch. Crunch. A shovel rhythmically dug into the porous soil of the Virginia countryside. It was 1774 and young Thomas Jefferson was overseeing the planting of grape vines near his Monticello estate in the days before the American Revolution. The seeds of America’s wine industry were planted and the Monticello Wine Trail was born. Over 240 years later, we traveled to Charlottesville, Virginia and the Monticello Wine Trail to see just how far we’ve come since Mr. Jefferson’s time. As it turns out, America’s viticultural pursuits have come a long, long way. While a wine industry was attempted in the 18th century, Virginia’s wineries didn’t really get underway until the 1970s and 1980s. 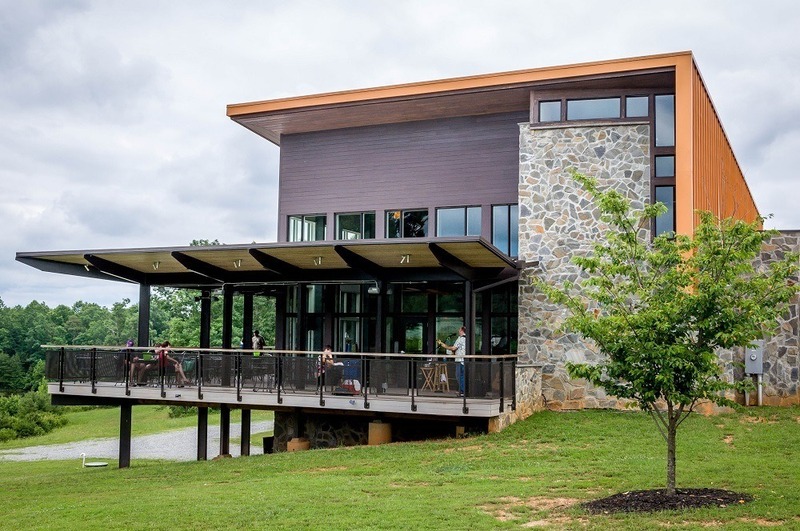 Our trip involved visiting six wineries in the Charlottesville/Richmond area, including those on the Monticello Wine Trail and the Heart of Virginia Wine Trail. We found a tremendous variety, both in terms of the quality of the wines and in the tasting experiences. The Barboursville Vineyards are probably one of the most beautiful we’ve ever encountered anywhere in the world. The 180 acre vineyard was founded in 1976, but recalls the glory of the stunning 18th Century estate, which serves as the backdrop for this memorable wine tasting. 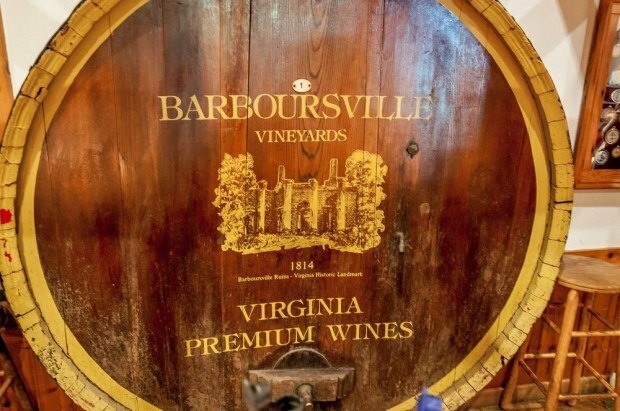 Barboursville is the oldest vineyard on the Monticello Wine Trail and features historic ruins, which were designed by Thomas Jefferson. We enjoyed a number of wines at Barboursville, including the Chardonnay 2013, a cold fermented, strongly acidic vintage with lots of green apple notes. In dry whites, the Sauvignon Blanc Reserve 2013 has a heavy minerality and almost earthy quality. For red wines, we both enjoyed the Cabernet Sauvignon 2012 – a complex wine with lots of layered flavors, including black currant and cloves with a delicate tannin structure. Unfortunately, the woman conducting our tasting was more interested in getting to lunch, so our tasting experience was rather abbreviated. On the current site of Jefferson Vineyards, the first New World vines were planted in 1774, giving birth to American wine. The plantings were a joint venture called The Virginia Wine Company between between Mr. Thomas Jefferson and Italian winemaker Mr. Filipo Mazzei (Jefferson had brokered the sale of the land bordering Monticello to Mr. Mazzei). Longtime readers of Travel Addicts will recognize the Mazzei name from our Cantine Aperte experience in Italy. 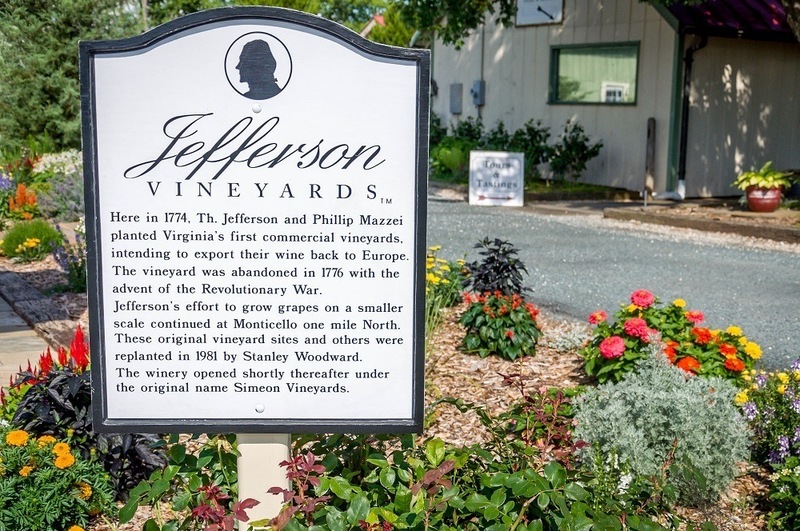 Mr. Jefferson was committed to viticulture and the evidence of his efforts remains to this day. Mr. Jefferson’s Monticello towers over the Jefferson Vineyards, making this an extremely picturesque spot for a picnic. The tasting room can be extremely busy, but the wines are well worth the wait. 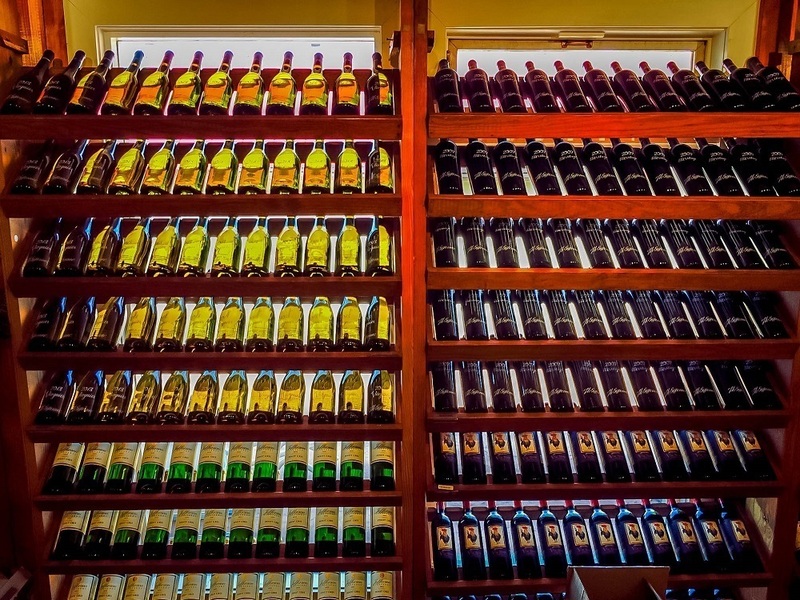 The tasting room staff is extremely knowledgeable and helpful. We almost never like Rose wine, but the Rose 2013 surprised us – this dry, French-styled wine had a delicate peach bouquet and heavy melon flavors. The bold Chardonnay Reserve 2013 offered well-rounded vanilla and citrus flavors. But the bottle we took home was the Meritage 2007, a Bordeaux-style blend featuring just Cabernet Franc, Merlot and Petit Verdot grapes. The initial peppery tannin rush is rounded with deep black cherry and soft chocolate notes making this a very long finishing wine (I’m smitten). The Meritage is a wine worthy of Thomas Jefferson himself! 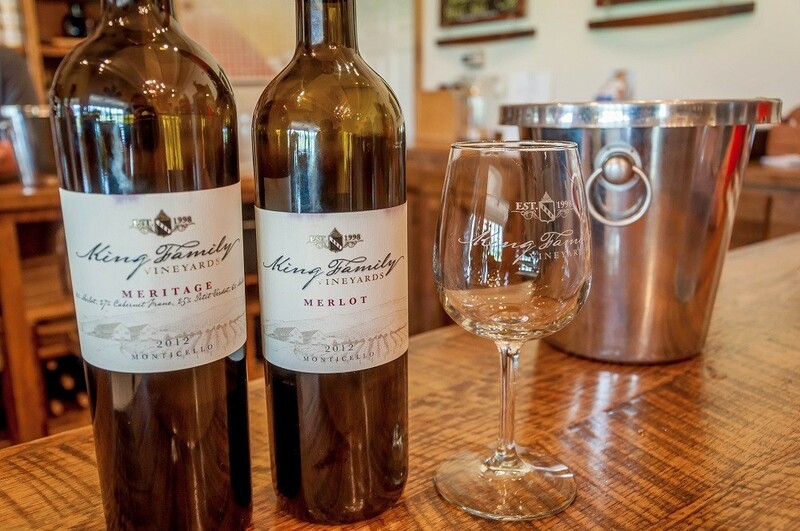 The family owned and operated King Family Vineyards is the total package on the Monticello Wine Trail – an amazing location, an incredibly knowledgeable tasting room staff and world-class wines. The two standouts at King Family Vineyards are the delicate Viognier 2013 – a lightly acidic white with a floral bouquet and a long, clean finish with just a hint of minerality reminiscent of a Sauvignon Blanc. But the patriarch of this winery is the Meritage 2012. This bold Bordeaux-style blend punches way above its weight. The addition of a small amount of Malbec gives the wine a spicy pop on the palate. However, this Meritage is more than gimmick – it is well tannined, with complex black cherry/berry fruit-forward elements and an earthy, black tea finish. This very well be my favorite wine of the year (we’ll have to see when we open that bottle!). 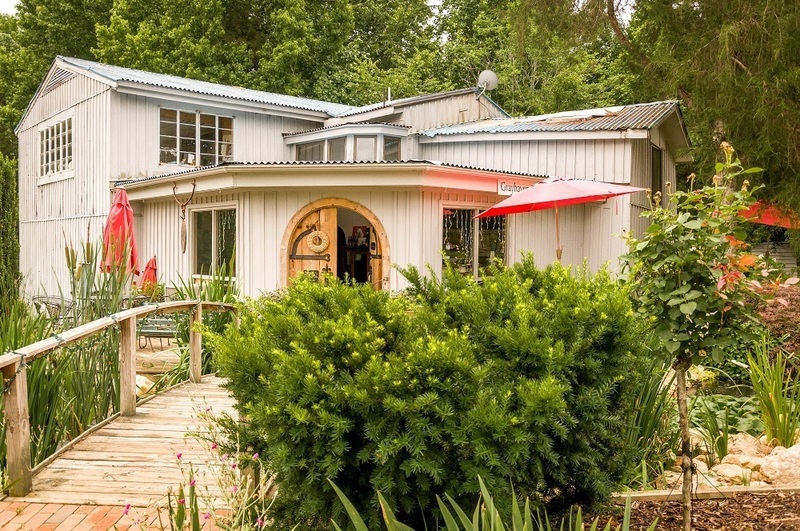 Set among rows of vines, the copper-colored Cooper tasting room welcomes visitors from near and far. Since 1999, Cooper has been one of the archors of the Heart of Virginia Wine Trail. When we arrived, one Sunday afternoon, a local musician was just beginning his set on the outdoor balcony. Cooper makes for the perfect setting for a weekend picnic and dozens of families were engaged in that activity. On the wine front, of note is the Estate Bottled Chardonnay 2013, an unoaked, estate grown, smooth Chardonnay with strong floral notes. We generally don’t love heavily oaked Chardonnays, but the Cooper Chardonnay 2012 is a soft vintage with bright peach notes – an excellent wine for the hot summer and it just made me a crave a fresh avocado salad! Of the notable red wines is one of Cooper’s top sellers – the Norton Reserve 2012. The Norton Reserve is a complex estate vintage utilizing the native Virginia grape and projecting strong black cherry flavors layered with light spice notes and supple tannins. This is a beautiful complex wine and one of the favorites of the entire trip. Carved into a forest not far from I-64, a gray building with a Japanese koi pond houses the South African inspired Grayhaven winery. Since 1978, Grayhaven has been a family owned winery, making it one of the oldest independent vineyards in Virginia. We visited right after a large event and they were serving mostly South African imported wines, not their locally produced vintages. We had just returned to the U.S. from a South African vineyard tour, so we were looking forward to the estate wines. Of the few locally produced wines served in the tasting room, the refreshing sangria would be a perfect wine for the harsh, hot, humid East Coast summers. – Weston occupies a beautiful 14 acre hillside and operates as a vineyard, country B&B, and animal rescue. The vineyard focuses on pure varietals and fruit blends – with a strong focus on the latter. The one notable wine at Weston Farm is the 2010 Meritage – this bold Bordeaux-style blend possessed mellow tannins and a strong black currant character. 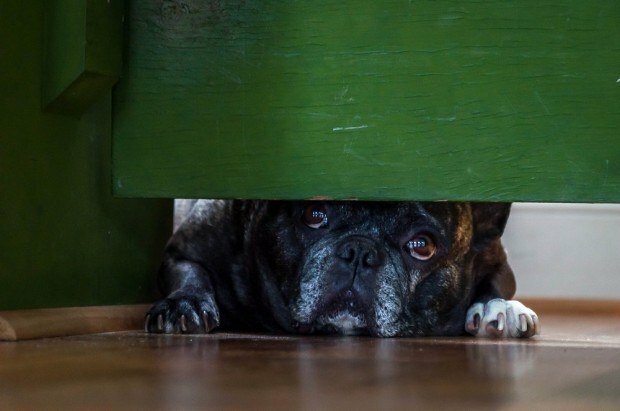 But, perhaps the real highlight of Watson Farm had nothing to do with wine – it is the owner’s French Bulldogs, which welcome guests to the tasting room. We were extremely impressed with the wineries of the Monticello Wine Trail and are already planning return revisit. 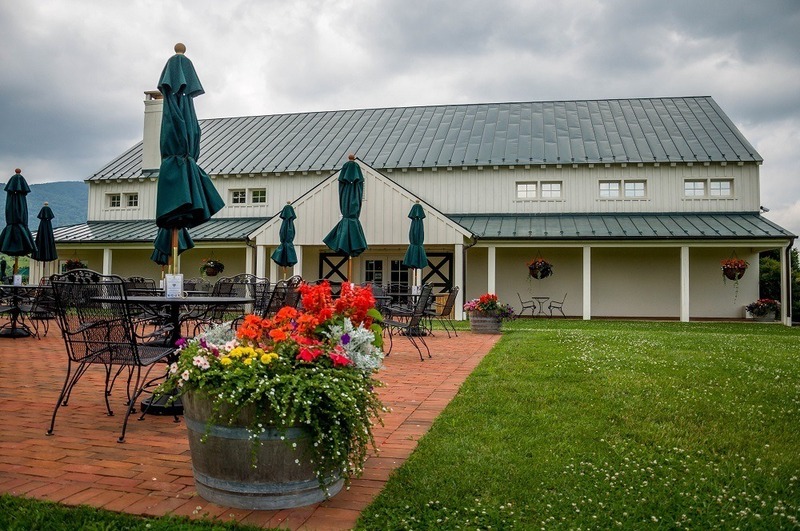 Barboursville Vineyards, 17655 Winery Road, Barboursville, VA 22923. Tasting fee of $7. Hours: Monday-Saturday 10:00am-5:00pm; Sunday 11:00am-5:00pm. 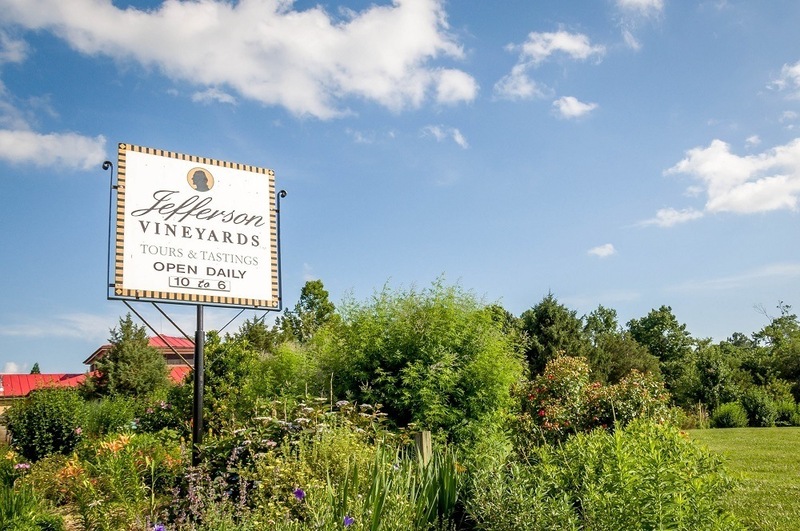 Jefferson Vineyards, 1353 Thomas Jefferson Parkway, Charlottesville, VA 22902. Tasting fee applies, includes souvenir glass. Hours: open daily 10:00am-6:00pm. King Family Vineyards, 6550 Roseland Farm, Crozet, VA 22932. Tasting fee applies. Hours: open daily 10:00am-5:30pm. Cooper Vineyards, 13372 Shannon Hill Road, Louisa, VA 23093. Tasting fee applies, glass not included. Hours: open daily 11:00am-5:00pm, except major holidays. Grayhaven Winery, 4765 East Grey Fox Circle, Gum Spring, VA 23065. Tasting fee applies and is not waived with purchase. Hours: Monday 11:00am-5:00pm; Tuesday-Wednesday by appointment; and Thursday-Sunday 11:00am-5:00pm. Weston Farm Vineyard and Winery, 206 Harris Creek Road, Louisa, VA 23093. Tasting fee applies. Hours: open Tuesday-Sunday 11:00am-5:00pm. 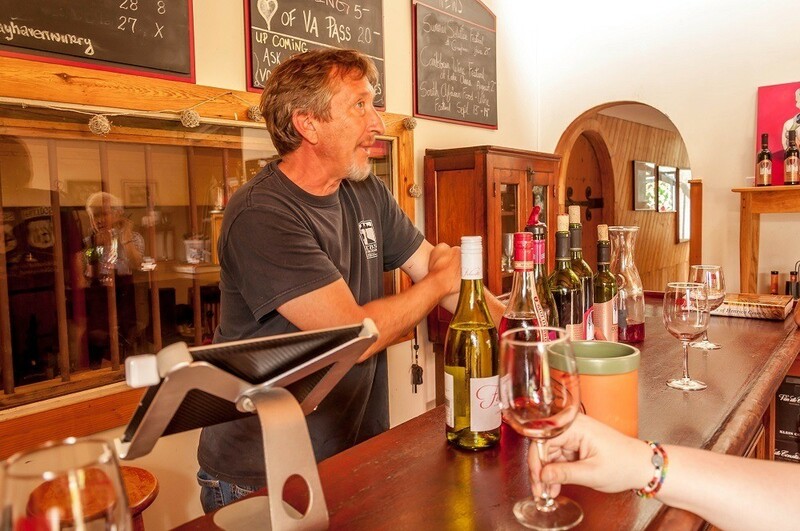 What do you think about The Birthplace of American Wine: The Monticello Wine Trail? Cool post, I never really gave the history of American wine much thought really. I’m more of a beer guy, but love to take wine tours whenever I travel. Recently visited some wineries in Colorado, which were impressive. Will have to put this Virginia wine trail on my future travel list. How cool is this?! Another wine region to add to my list. Unfortunately the local liquor stores don’t stock wine from Virginia but it’s something to look for when I venture down to the states. Definitely do. They’re the best we’ve had outside of the typical US wine areas. Nice! Despite growing up in Virginia and going back for frequent visits, the only winery I’ve made it to on this list is Barboursville. I usually stick closer to home (the Northern VA Region/Middleburg AVA and Shenandoah Valley AVA) so this gives me a good idea of wineries to try when I venture south again. So glad you mentioned both Meritage and Norton – both remind me of home. I did this wine trail a couple of years ago and was impressed with the wine but even more with the setting and all the history around it. I enjoyed the grounds of Barboursville the most with the ruins of a Jefferson-designed mansion a short walk away from the tasting room! I am so happy to live in Northern Virginia, close to the ever-growing wine industry. Of course I have ventured to C-ville and those exquisite wineries. King Family has such a gorgeous setting; they host polo matches on Saturdays in Spring and Summer. The head winemaker at Barboursville just received some high certification from Italy. Perhaps the highlight of the region, for me, was Glass House, which pairs their wines with custom, homemade chocolates. Incredible. I would love this wine trail! As we didn’t get interested in wine until we moved to Europe, I too had no idea about the origins of wine in America. It makes me want to hop on a plane home to Pennsylvania and take a road trip. I too am more of a beer guy than a wine person, but these look like a great set of wineries to visit. YUM! We have visited the Jefferson Winery as well as some others in the area including the Trump Vineyards and an apple orchard. Didn’t realize that’s where wine in America got started! You always hear about Napa not VA 😛 Great post! Great overview of the Monticello Wine Trail. I didn’t get to these on my short stay there, so it was interesting to see other options. 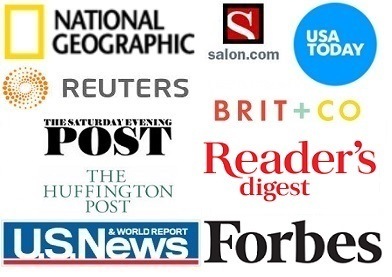 Wonderful write-up – I’ll be reading you more! Wow! Who would have known that the birthplace of American wine would be in Virginia of all places?! 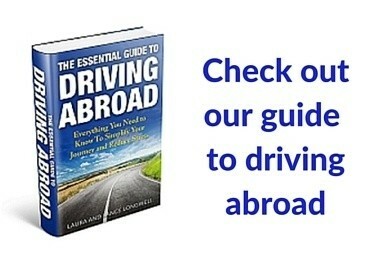 I look forward to getting down there soon to discover it myself – thanks for sharing this great information! I visited Monticello as a child with my dad, the history professor. It was a great experience and we’re planning do the same with our kids in the next few years. I wasn’t aware of the Monticello Wine Trail or its historical value. I totally plan on exploring this when we go…it will make our American history trip a little more fun and enlightening for myself and my husband. We loved both the wine trail and the visit to Monticello. A lot of excavation and other work has been going on at Monticello, so I’m sure there will be even more to see when you go with your kids. Virginia makes some fabulous wines, Barboursville and King Family are 2 of my favorites!